Sure, you can earn cash back on your credit card or rack up some frequent flier miles. But do you actually use your miles—or do you find yourself redeeming them for magazines you don’t even read? And while cash back is nice, it usually doesn’t make a huge difference to how much money you have in the bank. On the other hand, your credit card rewards could make a big difference to your favorite charity. Groups working to protect the planet are usually non-profits with very limited budgets that don’t begin to match how much they’re trying to get done. Why not earmark your credit card rewards for sustainability-focused programs and initiatives that you’d like to support anyway? Here are five ways to get started. 1) Donate your cash back rewards to your favorite organization. Some groups only charge an annual membership fee of $15. That might be the amount of cash back you earn in a month. Look at your credit card statements for the past 12 months to determine how much cash, on average, you’ve earned per month. Then set up an automatic bill pay relationship for that amount with your favorite environmental charity. This is probably the most hassle-free way to donate —and it won’t cost you anything out of your normal budget. Many environmental organizations conduct field research, travel to Washington, D.C. to meet with their members of Congress, or bring activists to their state capitals to huddle with legislators and participate in rallies and other events. When you donate your miles, you’ll save these groups big bucks they might otherwise spend on plane, train and bus tickets. 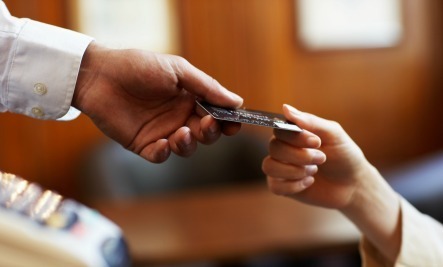 3) Get a credit card that automatically benefits an environmental group. For example, Sierra Club has partnered with One PacificCoast Bank, FSB, a community development bank, so that a percentage of every purchase made using the Club’s Visa Platinum credit card “furthers the Sierra Club’s mission to protect wild and scenic places for future generations.” The Nature Conservancy and World Wildlife Fund have both partnered with BankAmericard in a similar arrangement. 4) Earmark your rewards for carbon offsets. The Sustain:Green credit card, a MasterCard, encourages consumers to offset their carbon “footprint”—how much carbon dioxide their behavior generates—by using their card. Sustain:Green reduces a user’s carbon footprint by 2 pounds for every dollar spent. Plus, the company will reduce a customer’s carbon footprint by an additional 5,000 pounds of carbon offsets when the first purchase is made within 90 days. Sustain:Green has partnered with the non-profit American Carbon Registry and the Mata No Peito rainforest initiative to achieve its goals. Bonus: The actual card is biodegradable. 5) Redeem your points for a contribution to a charity. Automate this if your card or bank allow you to. Otherwise, put it on your calendar to do every quarter—if you wait until the end of the year, competition from holiday spending and other expenses might get in the way. 6) Use a credit card set up specifically to donate to non-profits. CREDO donates ten cents to nonprofit organizations with every CREDO Visa card purchase. The user earns triple points for grocery store purchases and charitable giving. The donations can be earmarked for any of the 50 charities CREDO supports, including the League of Conservation Voters, 350.org, the Organic Consumers Association, Black Lives Matter Fund, and Stop the Next War Fund. I have a ordinary debit card, my bank has awards programs, but I don't use them. Reward cards can charge more expensive processing fees to the small businesses I frequent, so I switched to an ordinary VISA card. I don't like to carry cash. Very nice ideas. Thanks for posting. Have a beautiful weekend ! Be all blessed as all your loved ones. Thank you for sharing this interesting article !